In some cases, injuries don’t present themselves immediately. Often a car accident victim that hasn’t experienced immediate symptoms does not seek medical treatment. An issue arises when a victim begins to experience symptoms a few weeks later. Delayed injuries are more common than one would think. In this situation it is harder to ensure full compensation. The defense may question the cause to your delayed injuries which can be hard for you to prove. The most important thing for a person involved in an accident is to seek medical treatment immediately. 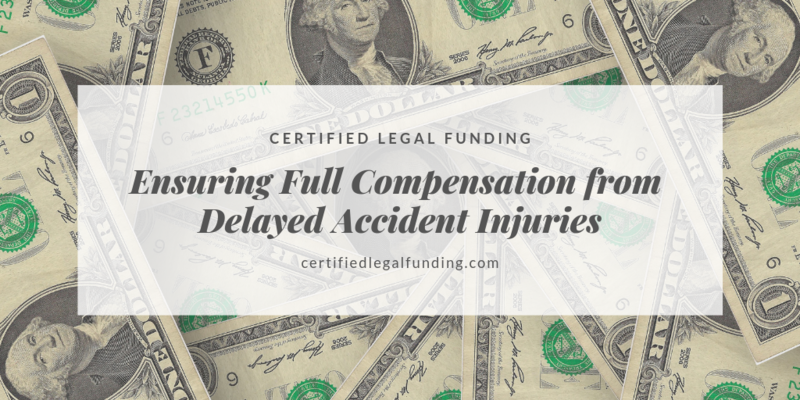 It is important for people that experience delayed injuries from car accidents or any other personal injury situation get the compensation they deserve. You may be worried that you can’t prove the delayed injury was from your accident – but fortunately there are ways. Headaches – Delayed head injury is a common delayed symptom after being injured. Head injuries are not to be dismissed. Headaches can be a sign of serious problems such as a concussion, whiplash, neck injury, or even a brain injury. If you notice a change in head pain it is important that you visit a doctor immediately. Neck or Shoulder Pain: If you begin to experience neck and shoulder pain this can be a sign of whiplash. Neck and shoulder pain can also be the result of a spinal cord injury, Whiplash occurs commonly in a car accident. Back Pain: If you have lower back pain, whiplash is yet another common cause of the pain. Back pain can also be a symptom of muscle damage, a sprain, herniated disk or other related injuries. Tingling or Numbness: Tingling and numbness most commonly occurs in the result of a pinched nerve. It is common to be experienced along with back pain or pain in your limbs. Abdominal Pain: If you experience delayed pain in your abdomen you should seek medical attention. Abdominal pain can sometimes mean serious injury such as internal bleeding. If you notice bruising, headaches, and dizziness seek medical assistance. PTSD or Emotional Pain and Suffering: If you were a victim to a severe accident this can often lead to pain and suffering. More specifically anxiety, depression and PTSD. If you are having traumatic memories frequently you may have PTSD. These symptoms are commonly delayed. If you are finding yourself with these symptoms, it is important to seek PTSD treatment. The first thing you should do is receive medical treatment. Have a doctor take a look and asses your body parts for injury. Secondly, never sign a release of liability form. If you sign the form, you will end any current lawsuit and all future claims. If you have already signed a release of liability, you may lose out on compensation of your injuries. Consult an attorney before signing such a form. Once you receive a medical evaluation it is important to get an estimate of future medical expenses which will affect your settlement amount. It is also important to acquire as much evidence as possible in order to prove negligence. Dealing with the cost of medical expenses as well as going through a lengthy legal process can be extremely expensive. Receiving compensation from a personal injury case can be lengthy and place a person in a tough situation. For the benefit of your claim, case, and life legal funding is available. Legal funding will cover your medical costs, lost wages, and other life expenses so you can receive a high settlement. Legal funding and cash advances can help you drastically. If you find yourself having difficulty with monthly medical bills and living expenses, Certified Legal Funding offers pre-settlement funding. Certified Legal Funding works to get you the money you need as fast as possible. If you don’t win, you don’t pay. Call today at 1-800-922-7439.